If you’re coming back to the UW-Eau Claire campus – whether as a returning student, staff member, or visitor – the biggest change you’ll notice at the start of the fall semester is the completion of the long-awaited reconstruction of Garfield Avenue. The $12.4 million project, which began early in 2017, has included replacing outdated underground utilities; removing the Putnam Hall parking lot to make way for an outdoor classroom; reconfiguring the south end of the footbridge; and converting this part of Garfield Avenue into a pedestrian and bicycle thoroughfare. The majority of the work will be completed by Aug. 31, although landscaping will continue into the fall, as will the donor-funded construction of a new gateway and water feature. During August, work is expected on grading, landscaping, and installing irrigation on the site; putting the final layer of asphalt at the end of Roosevelt Avenue; completing concrete work and installing brick pavers between Hibbard Hall and the Zorn/Brewer/Kjer complex; laying sod beginning in Putnam Park and continuing east through the project area; installing handrails along the sidewalk next to the river; and installing a gate arm at the base of the hill. The renovation of the north tower began this summer and is expected to be completed by the student move-in in fall 2019. The David Karlgaard Hall renovation is the second phase of a $38.9 million project that also included the renovation of Marilyn Karlgaard Hall, the south tower of Karlgaard Towers. The south tower renovation is nearly complete, with some work remaining in the building’s common areas. Starting Sept. 1, students will begin moving into Marilyn Karlgaard Hall for the fall semester. 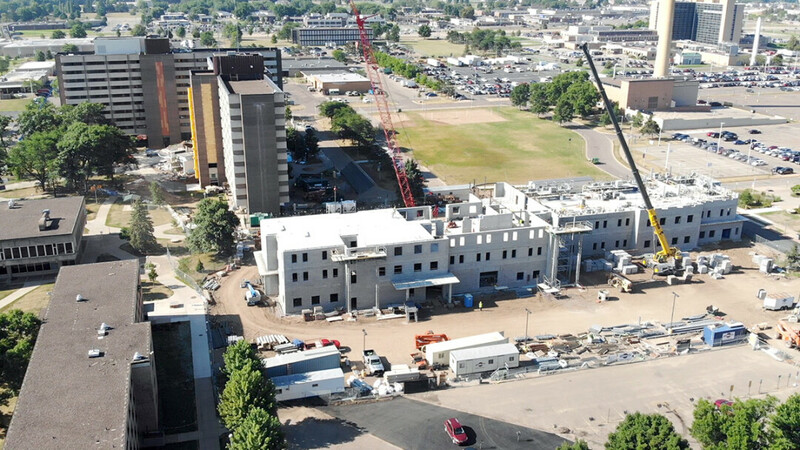 Nearby, just north of Karlgaard Towers, work continues on a new, unnamed residence hall which is is scheduled to house 432 students when it opens in August 2019. The $35 million, six-story residence hall will include living areas that will house four students each, some with single bedrooms and some with double bedrooms; floor lounges with kitchens; and music, game, social and study rooms. It is being built to address the long-term on-campus housing shortage. • Bowman Hall, the university’s oldest building including the iconic Clock Tower, exterior maintenance and repair, $8.95 million. • North Hall, one of the main residence halls with 371 beds, renovation and additions, $21.74 million; funded with student fees. • Merle M. Price Commons, the main student dining hall, first floor renovation, $7.57 million; funded with student fees. The projects began in late spring and are expected to wrap up in summer or fall 2019, with no winter work at Bowman. They were approved in June 2017 by the State Building Commission and previously approved by the UW System Board of Regents. Work on Bowman Hall, built in 1897 by school founder James Huff Stout, includes repairing approximately 24,000 worn and damaged bricks and stone accents; repointing, or replacing mortar between bricks across the exterior of the nearly five-story building; and installing new, historically accurate windows and doors. The 135-foot Clock Tower, in addition to brick work, will undergo steel structural support repairs and get a new copper roof and upper level doors. The lone interior project will be exposing part of an original ceiling in the one-story south annex, which houses Registration and Records offices. Renovation at North Hall, built in 1967, will encompass about 76,000 square feet and add about 14,000 square feet. Three small additions will house relocated mechanical operations, a second elevator, and expanded bathrooms.